A cosy double room with kitchenette. Double bed and a private bathroom with shower. 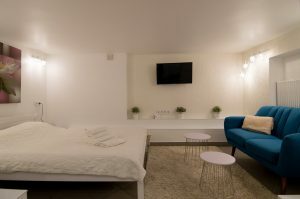 The room is equipped with a refrigerator, microwave, kettle, dishes and a flat-screen Smart & Android TV. The room size is 14 square meters or 150 square feet. A romantic and quite Studio apartment on the ground floor. Double bed and a private bathroom with shower. 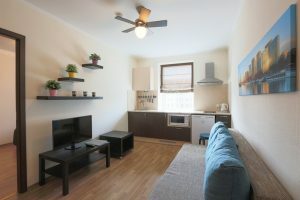 The apartment is equipped with a fully equipped kitchenette with a refrigerator, microwave, kettle, dishes and a flat-screen Smart & Android TV. The apartment size is 19 square meters or 204 square feet. 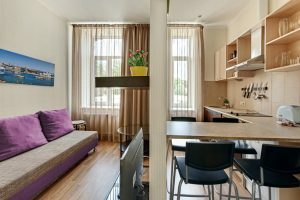 A small and modern one bedroom apartment consisting of a fully equipped kitchen and a living room which has a pull-out sofa and flat-screen 32″ TV. The bedroom has a king size double bed and a large wardrobe. The apartment size is 37 square meters or 400 square feet. A warm and welcoming one bedroom Family apartment decorated in modern style. The living room is linked with a fully equipped kitchen and a sitting area which has a pull-out sofa and a flat-screen 32″ TV. The bedroom has a large wardrobe, work table and special Family bunk bed for 3 persons . The apartment is ideal for small families. The apartment size is 37 square meters or 400 square feet. The relaxing lounge has comfortable sofas and a flat screen 42” TV. The linked dining area and a fully equipped kitchen provides all your needs during your stay. Each bedroom has a king size double bed and a large wardrobe. One of the biggest advantages of the apartment is the convenience and simplicity of the interior. This is a very stylish apartment for a group of friends or a couple with children.